I think there’s something about this Samhain season causing serious rifts between people who otherwise get along just fine. I’ve had to deal with a friendship turned sour, and so has a good friend. I’m talking with someone now who has asked me to intervene in a community issue – something I have refused to do in the past, but this time feel it is appropriate and necessary for me to get involved. You are one of many, many who’ve told me similar stories that all occurred THIS MONTH. 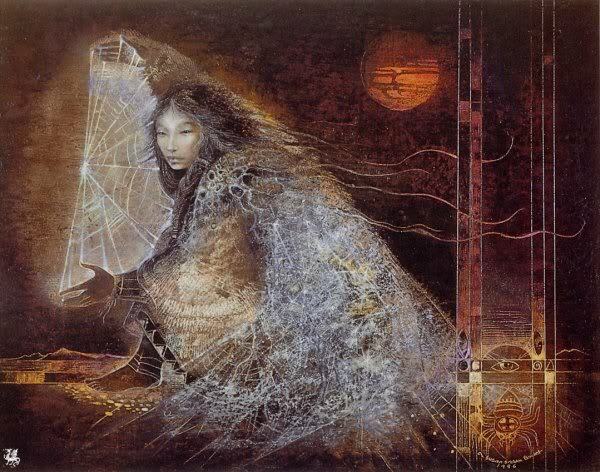 Something more is happening than the usual Samhain veil thinning. Nothing occurs in a vacuum. Given all the political unrest, I would expect a certain amount of anxiety to spill over into our spiritual lives. Ahhhhh yes. Point well taken. It’s a presidential election year, and we can hardly expect Samhain energies to be complacent at such a time. And let’s face it – religion hasn’t done the best of jobs at staying out the political arena this year. I have to confess that I am finding those Samhain energies to be packing a big wallop for me personally. Earlier this month I got into a major disagreement with a local Pagan that basically escalated into a shouting match resulting in a “wanting nothing to do with each other” estrangement. And recently I had a not-so-pleasant exchange of words with a good friend I’ve known for several years. Mind you, I’m not saying that these conversations can or should be totally blamed on the Sabbat. I have to hold myself accountable for my conduct, for which I must admit to feeling embarrassed and ashamed. And yet, there definitely seems to be something going around that’s bringing out the worst in me – leaving me feeling like a ticking time bomb…ready to explode at the slightest provocation. I’ve noticed it in others too – not just in my own conversations with them, but in observing how others are interacting with one another. Comments on Facebook, exchanges in forums, statements made in emails. Everyone seems to be edgy, everyone seems to be irritable…snapping at one another and basically trying to do their best to keep from lunging at each other’s throats. You are so spot on. Funny that you mention it as I almost told you the same thing earlier, but for some reason bit my tongue. My sister and I talk about it at great length. We have both even said that if things keep up it’s going to make for an interesting Samhain evening especially with the full moon 2 days before. I have been told this is a common occurance for the Samhain season; it’s a very raw energy with the lessons attached to it having a harsher edge. Considering it is the season when the curtain is at the thin point and the hibernation and inward trek is setting in for most people, then things certainly will be more chaffing and raw. After all – the thinner the curtain gets, the more flows through…and it’s like two currents coming together. 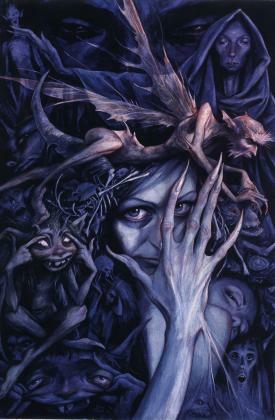 I think in the old tales the terrors of the Sidhe were not so much the Sidhe themselves, but rather the energy from their realm pouring out in torrents into the mortal world. That would overwhelm most people, even if it was just once a year. Indeed, I can imagine that the energy pouring out from the other realm would be terrifying for some, and at the very least unsettling for many. So how do we deal with it? I’m not sure I have any easy answers…I’m not having the best time dealing with it myself. Some of it you just have to work your way through the best you can. But at the same time, as I have said to others – it is important to recognize and acknowledge this “change in the air,” and understand that these changing energies can effect us. We need to breath, to center, to ground ourselves. And we need to always remember to work from a place of compassion. And if all else fails, just remember to fasten your seatbelt – it’s going to be a bumpy ride! And I have to agree with you in return, Fyre. I think that this is indeed part of something bigger. My High Priestess friend commented on how maybe this is all part of a higher consciousness that is coming at the Winter Solstice (December 21, 2012…supposedly the end of the world in the Mayan Calendar), and perhaps all this “bubble bubble toil and trouble” is part of a process to weed out those individuals who just don’t have what it takes to handle the responsibilities of being Pagan. It’s not all “love and light,” you know. I think we can all agree that the end of the world isn’t going to come in December, but I do think it will be a ending of sorts. There will be a major shift in our perception…which leads to transformation. Clearly the change is happening, whether we like it or not. But I think it will be a positive change. A change to a fuller range of possibilities, to a broader spectrum of spirit. Not change to something else…but to something more. First we learn to know ourselves, then we expand… stretching our hearts and minds and souls, and exploring and developing new territories within ourselves, and within our community. The shadow period of a retrograde is where the problems show; the actual retrograde period is where we review what has gone wrong. I personally have found retrogrades in fire signs bring out **nasty and stinging** arguments. Nov 6 – 26 will give us a second look on situations. If you can, hold your judgement on people till after the 26th. Saturn in Scorpio is even more fun — we may be limited by very dark stuff. The next 2 1/2 years will have us faced with amoral/possibly violent actions. It’s is a longer influence, but it bites now with the others influences. Uranus Pluto squares have the energy of rebellion and the God of death/transformation are colliding with us in the middle. This makes for a lot of fights and challenges to stay/go, change or not change. The last time Uranus was in Ares was the rise of Hitler. We’ll see some fanatical change. Finally Jupiter is on retrograde (vacation). the God of order, luck and morals has left the building. Look to its shadow period(June – August) to see the things that have been bubbling up in these areas. They’re coming to a head now. It’s not all bleak, but things are in a rough ride – we’ll have better communications in January and Jupiter turns direct about Imbolic. Things will be brighter then. In the meantime, the best thing is to stop and listen to others and our reactions to others. In the end it will get rewarded, just not right now. Hang in there and enjoy the wild ride – remember people don’t tell stories about the good times, we tell stories about how we triumphed over the dark. :-). Best wishes to you all. Thanks for the information! I am not a skilled astrologer by any means, so your explanation of things is interesting and helpful, and gives another perspective for us to consider. I am curious…is there any way to put a “spiritual spin” to this information? You’ve done so to an extent, but I am wondering how we can merge these astrological workings with the turning of the Wheel of the Year, and our celebrations of the Sabbats…and perhaps to a lesser degree our monthly Esbats and our daily practices. There is so much that can be done with Astrology and Wicca! But if one starts off with astrology, I’d suggest using astrology as a “weather report”. Take note of astrological forecasts during times you’re interested in. For example, if you want full moon and new moon forecasts, the Mountain Astrologer publishes a bi-monthly magazine that has a full page description of various influences and some interpretations. Other longer influences can be seen at sites like cafeastrology.com, or even googling the influence (e.g., Saturn enters Scorpio). Many people put out various things to think about when working with these influences. Once you’ve got your influences and a sense of what they mean, the best thing to do is to sit and meditiate on the influences and the coming event (sabbat, Esbat, new moon). Think of what has been going on in your life and what you may want to change. For example, this year’s Saturn in Scorpio, it might be good to remind yourself that you’re limited in what you can change. Mercury retrograde indicates to review what is going on, rather than initiating new things. If I was designing a public Samhain ritual, these would start to be some of my goals: how can we learn to give things/events into death? Reflecting and asking wisdom from my ancestors. In other years, (depending on the influences) I might emphasize the new year aspect of Samhain. For me, astrology is like a language. For example, if I tell you that Samhain day will be, “partly cloudy with highs in the 40s”, you have a good sense of what that means and whether you’d like to hold an outdoor ritual (or not). But you have to have an experience of standing outside in 40 deg weather. If you we’re in Europe, you might even be thrown off wondering if I was referring to Fareinheight or Celsius. After a while, reading, meditating and experiencing will get you a feel for the language and the secrets/insights it will tell you. It takes a bit of work but in my case, the results are well worth it! For me, the tension and weirdness started toward the end of August!